Of Course Eat Bread – but not just any bread ! Of Course I Eat Bread… Daily !! I love a good sourdough bread. I like to slice my own bread so it is not too thick. My slices are usually thinner than sandwich size bread. (Note my photos below – taken today). No… I will not eat any bread with seeds nor grains in it… and I will not eat bread that is soft and floppy. A good bread is dense. Buy a sourdough bread that you can slice yourself and cut thin slices. Enjoy bread with your meals as well as a snack. Note: Always check the ingredients listed: Morpeth Sourdough (Traditional White Tin – is what I use) : Australian unbleached flour, filtered water, Australian unbleached wholemeal flour, iodised salt. 1) 8:40am – a slice of bread with avocado .. oil and lemon. 2) 3:05pm – homemade pumpkin soup with a slice of bread. Sauté using butter – onion, pumpkin, carrots – add some salt & pepper . 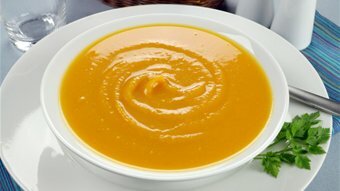 Pour in chicken stock so that vegetables are just covered – boil for about 15 minutes, or until vegetables re soft – add butter – then use hand-blender to make soup. Enjoy !